Bright, clean, balanced. Known to be the best Costa Rican Single Estate; refined by Alejo Castro Kahle, this coffee has a smooth honey and aged rum undertone. 100% Estate Grown Regional Costa Rican Arabica Coffee, Strictly Hard Bean, Shade Grown, Hand Picked Coffee using sustainable growing practices, natural organic fertilizers, no herbicides & non-chemical pest control. 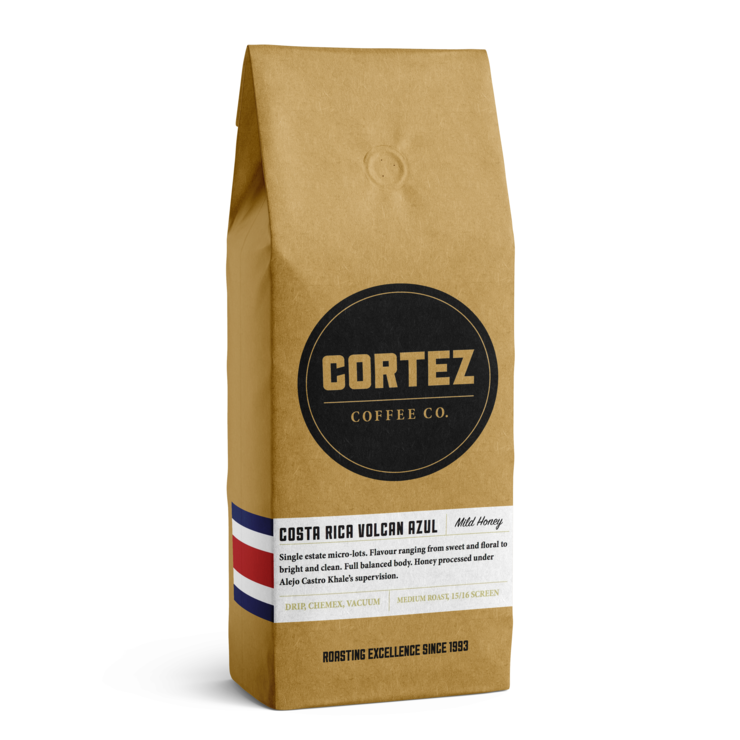 Cafe Cortez is a 3rd generation Costa Rican coffee company. The family has known and loved coffee and the land since birth. This honor of their land and country have let them to respect and protect the environment as well as respect their workers and pay them a fair wage, as reflected in their More Than Fair Certification. Hand Crafted for the best beans. All coffee beans are handpicked, selected for the hardest beans, sun dried, processed & packed on the farm, then shipped to the United States for custom roasting. When the coffee is processed and packed on each farm, you are assured of pure regional coffee, not a blend or mix of coffees from several farms! Arabica, High-Altitude, Hand-Picked, Strictly Hard Bean, gourmet coffee, processed under the most rigid quality standards. Our Arabica coffees comes from a more delicate, higher-altitude tree which grows at a lower temperature and receives only 2 hours of direct sunlight a day. The Arabica bean is harder and has a denser aroma. We roast our coffee with the most advanced roasting techniques to ensure the best final product. We only import coffee from the most recent crop, which makes a real difference in both taste and aroma.